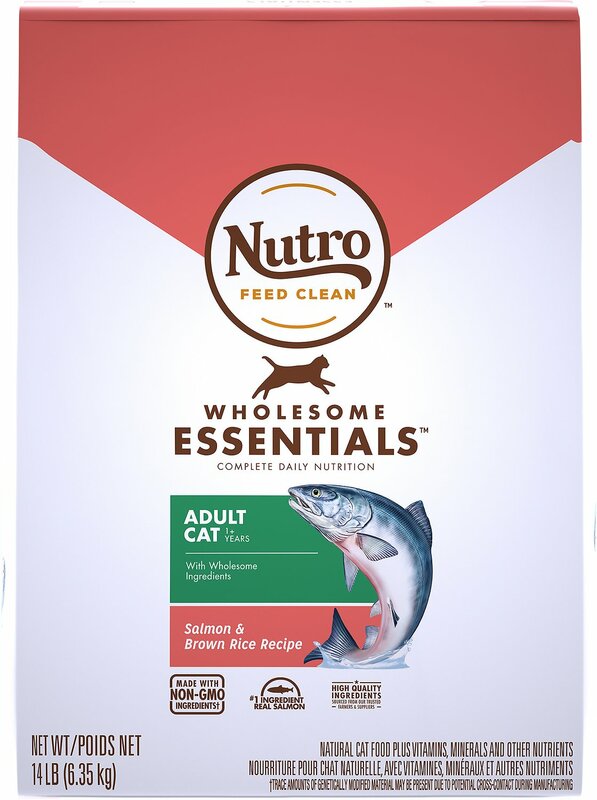 The clean recipe of Nutro Wholesome Essentials Adult Salmon & Brown Rice Recipe Dry Cat Food is just plain good for your favorite feline’s health. With real salmon as the very first ingredient, this recipe serves up the necessary ingredients for a complete and balanced meal, including plenty of nutrients and rich flavor. It helps promote healthy skin and a soft coat with omega 6 fatty acids, and it’s made with non-GMO ingredients—absolutely no artificial flavors, colors or preservatives either. And with natural fiber for healthy digestion and essential antioxidants for immunity, it’s food that you’ll love feeding your kitty as much as he'll love eating it. Number one ingredient is real salmon for a rich, savory flavor, plus natural fiber helps to promote a healthy digestion. Fortified with essential vitamins and minerals, including taurine, to deliver complete and balanced nutrition for adult cats. Formulated with optimal levels of omega 6 fatty acids to promote healthy skin and a smooth, lustrous coat. 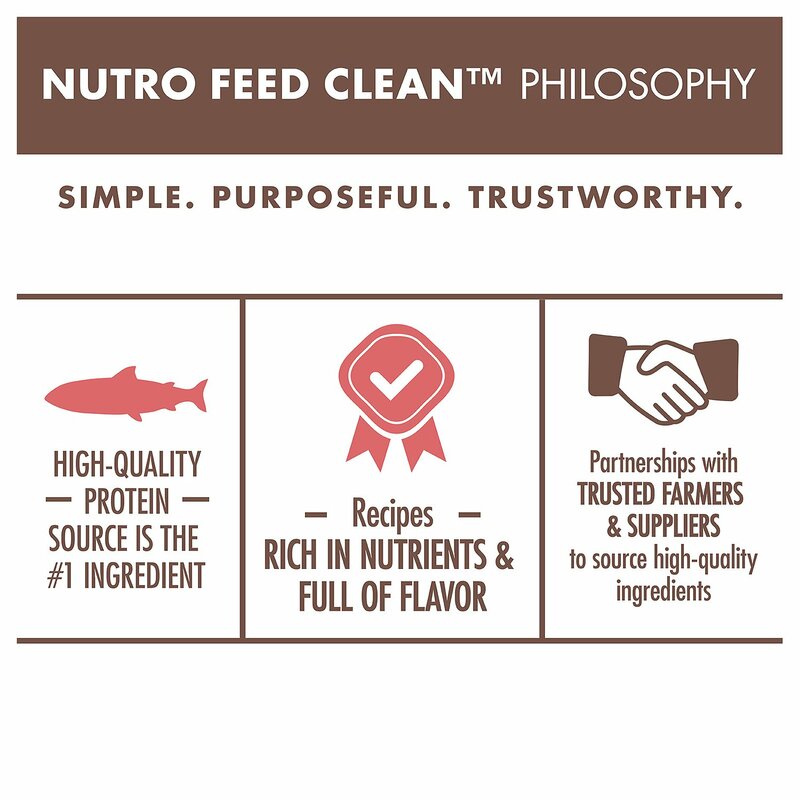 Clean recipe contains non-GMO ingredients, and absolutely no artificial colors, flavors or preservatives. 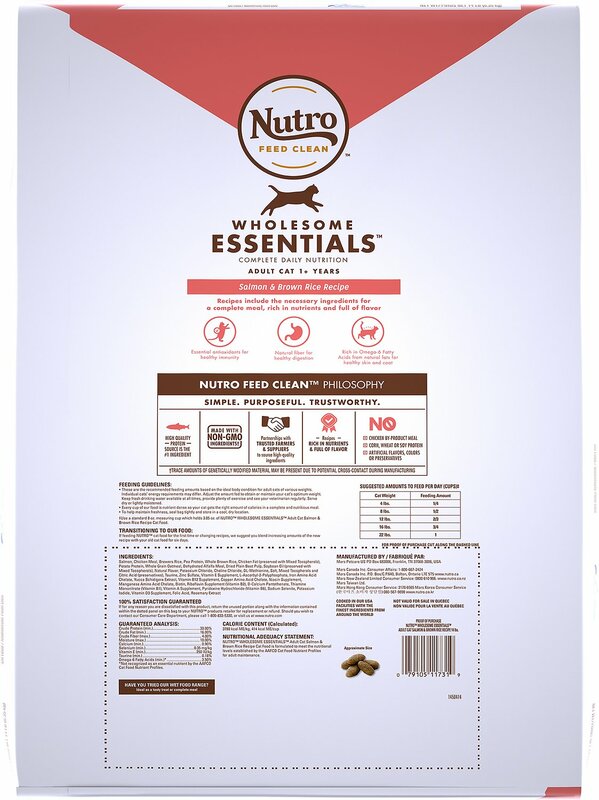 Proudly produced in the USA using natural ingredients sourced from Nutro’s network of trusted partners. Salmon, Chicken Meal, Brewer's Rice, Pea Protein, Chicken Fat (Preserved with Mixed Tocopherols), Whole Brown Rice, Potato Protein, Whole Grain Oatmeal, Dried Plain Beet Pulp, Dehydrated Alfalfa Meal, Natural Flavors, Soybean Oil (Preserved with Mixed Tocopherols), Potassium Chloride, Choline Chloride, Dl-Methionine, Salt, Taurine, Vitamin E Supplement, Zinc Sulfate, L-Ascorbyl-2-Polyphosphate (Source of Vitamin C), Iron Amino Acid Chelate, Yucca Schidigera Extract, Vitamin B12 Supplement, Copper Amino Acid Chelate, Niacin Supplement, Sodium Selenite, Manganese Amino Acid Chelate, Biotin, Riboflavin Supplement (Vitamin B2), Calcium Pantothenate, Potassium Iodide, Thiamine Mononitrate (Vitamin B1), Vitamin A Supplement, Pyridoxine Hydrochloride (Vitamin B6), Vitamin D3 Supplement, Folic Acid, Rosemary Extract, Decaffeinated Green Tea Extract, Spearmint Extract. 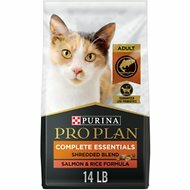 My 3 cats really enjoy this food and have been eating it for years now. Every once in awhile we do get a bad bag and they stop eating it. I have gotten in the habit of smelling the food to make sure it is good and getting a new bag monthly to keep it nice and fresh. 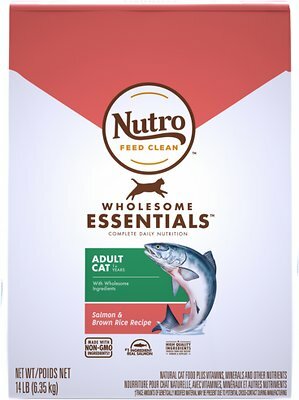 My cat loves all the different recipes of Nutro Wholesome Essentials Adult. I have been feeding him Nutro Essentials since he was a kitten, he is now 12yrs old and survived a large dog attack 2yrs ago and still runs around like a kitten! My 2 outside cats had gotten finicky and were not eating dry food. After trying 4 different brands of dry cat food they approved this one! As soon as I opened the bag, all I could smell was salmon! I only feed Nutro products to my pets and they all have incredibly soft and lustrous coats. The cats that we are fostering lost some excess weight and they shed less. I don't think that any of the cats are picky, however, they scarf their Nutro down like it's the tastiest thing they've had. I know that they're healthy, too. Been feeding my cats Nutro foods for years. My current girl, Penny, won't touch any other dry food variety. She likes what she likes and that's fine by me. 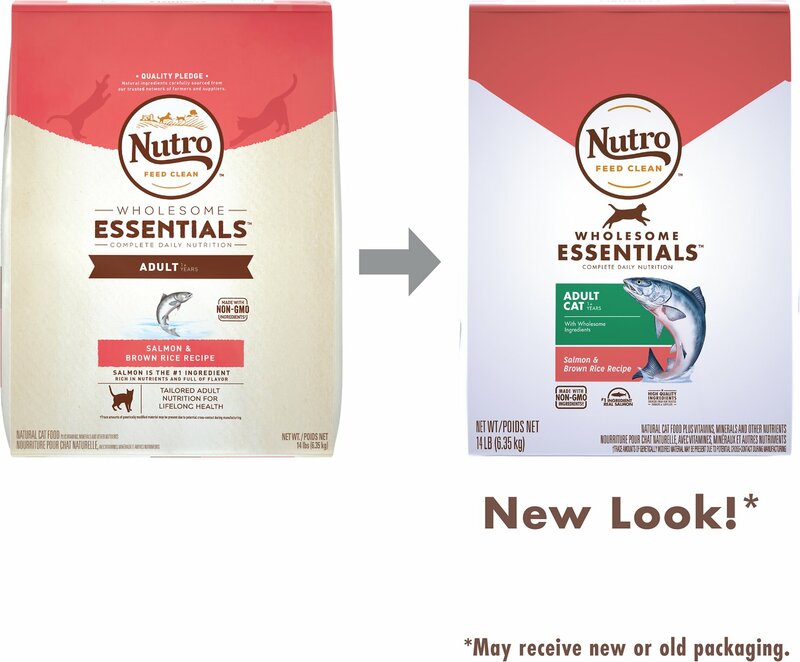 Started feeding Nutro Essentials to my rescued cats a year ago. I was surprised they ate it since they would never eat the Nutro Max. The ingredients sound healthy. Contains no "animal" products or "flavors" as many other dry foods contain. Wasn't sure about the herbs included but no health issues so far. The price here at Chewy has been less than other retailers. 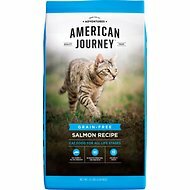 My cats were sneaking pieces of dry salmon dog food, so I decided to try a salmon cat food. All three cats (ages 10, 12, 18) love it, and its great to see the eldest cat eating alot more. I bought this a while back. My cats seemed to really like it. But it hasn't received the same enthusiasm as before. My younger cat Punkin won't eat it at all. My older cat Denny eats it but not impressed. I just don't understand. Did they change their recipe?? Our cats love the salmon and brown rice. Its good for young and old cats and their stomachs.